In 2010, Santa Fe officially turned 400—four centuries of a rich and contentious history of Indian, Spanish, and American interactions. Pueblo Indians settled along the banks of the Río Santa Fe as long ago as the sixth century CE. By 1610, Spanish colonists had established the town as a distant outpost in Spain's expanding empire. Drawing on recent archaeological discoveries and historical research, this updated edition of a classic history details the town's founding, its survival through revolt and reconquest, its turbulent politics, its lively trade with Mexico and the United States, and the lives of its most important citizens, from the governors Peralta, Vargas, and Armijo to the Madam Doña Tules. 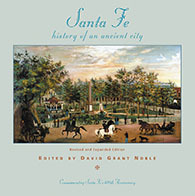 The origins and transformations of the very building blocks of Santa Fe, from the iconic Palace of the Governors to the city's acequia irrigation system, are revealed in these pages.